At Wilmington Oral Surgery, we have used 3D cone-beam computer tomography (CT) since the early 2000s. 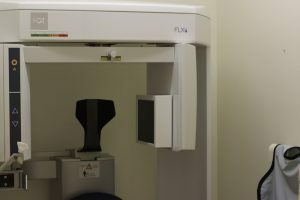 This technology is extremely useful in certain dental evaluations, diagnoses, and treatment planning, because it gives us 3D images of patients’ teeth, soft tissues, nerve pathways and bones–all in a one scan. Cone-beam CT is different than conventional CT you may have seen in outpatient clinics or hospitals–the machines are smaller and expose patients to less radiation. But it produces similar images. During a scan, a focused X-ray beam in the shape of a cone is moved 360 degrees around your head to make lots of images, also called views. No special preparation is required. We may ask you to remove your jewelry, eyeglasses, hairpins, hearing aids and removable dental work. Bring removable dental work with you to your appointment; we may need to examine it as well. If there is any possibility you may be pregnant, please let us know so we can take extra safety precautions. The scan is quick (approximately ten seconds), noninvasive and painless, and there are no immediate side effects. No radiation remains in your body. Dental cone-beam CT uses scatter radiation to provide clearer images than X-rays, allowing for more precise treatment planning. Views and angles can be manipulated for an accurate evaluation. Using CT with current software, we can plan complicated implant cases which previously were not possible. CT uses radiation, and there is always a slight chance of cancer from excessive exposure to radiation. However, after studying the technology extensively before purchasing our equipment, and using it for almost two decades, we believe the benefits of a complete diagnosis far outweigh the risks. Children are more sensitive to radiation than adults, so we recommend CT for our young patients only when it is absolutely essential, and avoid repeating scans whenever possible. The Food and Drug Administration regulates the manufacturer of dental cone-beam scans. For your safety, we follow their recommendations–along with those of the American Dental Association, American Academy of Oral and Maxillofacial Radiology, and American Academy of Pediatric Dentistry–in the use and upkeep of all our imaging equipment. It is understandable that you may have questions and concerns about CT. We will gladly discuss them at any time before, during or after your treatment; just give us a call.